This is it. The Galaxy Tab is the first Android tablet meant for humans. But is it actually fit for humans? No. Put simply, the Galaxy Tab is the first post-iPad tablet that matters, because it's the first tablet that's trying to be legitimate competition. It aims to break a lot of ground. 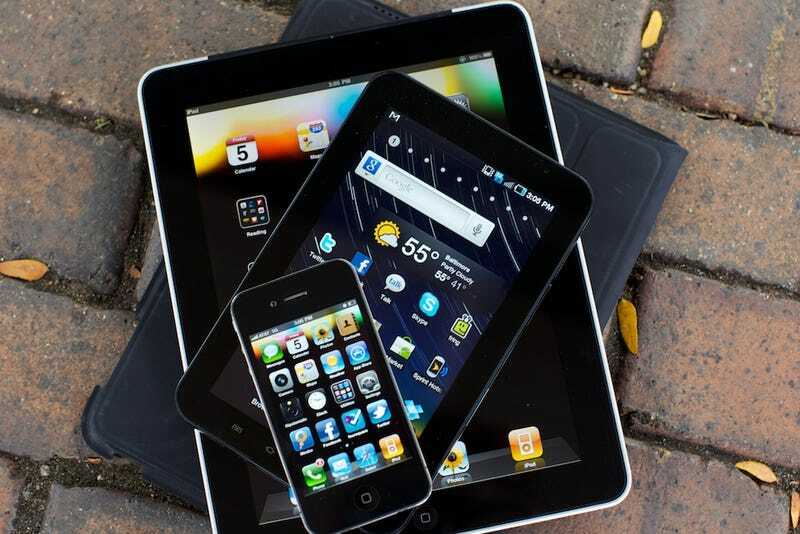 Powered by iOS's biggest rival, the Tab essentially kicks off the next generation of tablets. And, at the size of a paperback, it's one of the first to seriously test how well a seven-inch tablet really works. There's a lot riding on this thing. Here's the thing about tablets: Size is everything. Size is the whole point. It's what makes browsing, reading, creating and sharing better on a tablet than on a phone, even if they're both running the same software. If you take iPhone apps and simply scale them up for the iPad, most of them don't feel right. If you take Android apps and scale them up for the Tab, the majority of them—Twitter, Facebook, Angry Birds—work perfectly. (Except for when they don't, like The Weather Channel.) That's because the Galaxy Tab is small enough that apps simply blown up a little bit still fundamentally work. Which means, conversely, that there's almost no added benefit to using the Tab over a phone. It's not big enough. Web browsing doesn't have greater fidelity. I don't get more out of Twitter. A magazine app would be cramped. Videos do look better than they do on a phone, but a bigger tablet would be even better. There is no way to not feel like a total dorkface while typing on this thing. In portrait, it's like tapping on a massive, nerdy phone. In landscape, it's just dumb. You still have to thumb type, only you're stretching out further, and text entry swallows up the entire screen. Swype might be dandy on a phone, but on a seven-inch screen it doesn't work so well—you have to travel a lot further to sketch out words. In other words, you get the worst of a phone's input problems—amplified. In the places where Samsung tries to make the Tab feel more like a tablet than a big phone, it's not afraid to borrow liberally from what Apple's done on the iPad. The music app (a huge improvement over the standard Android player) bears an uncanny resemblance to the iPad's iPod app, while the faux-realness of the Calendar, Contacts and Memo apps feel like Chinatown knockoffs of Cupertino software. The Tab feels like a grab bag of neglect, good intentions and poor execution. Example: Samsung's built-in task manager, with one-touch kill switches to free up gobs of RAM, is plenty effective at dealing with apps running in the background. But why does it have to be there in the first place. Should you really be actively managing background apps? Feels dense, and sturdy (if surprisingly thick)—probably the best constructed Samsung mobile device ever. Screen is pretty killer. The pixel density—1024x600 pixels packed into a 7-inch display—makes everything from reading to watching video seriously pleasant. (Put another way: Reading Kindle books feels better than on the iPad.) The viewing angles are vast like the BP oil spill. The colors are nice and saturated—at least when you turn off the "power saving mode," which douses the screen with a sickly yellow hue. Battery life is thoroughly phenomenal: Four hours of constant, heavy usage over 3G—Google Talk, browsing, YouTube—only knocked it down to 40 percent. Building controls for Wi-Fi, Bluetooth and GPS into the Android notification shade makes it convenient to turn stuff off to stretch the battery further.